I love breakfasts in New York City. 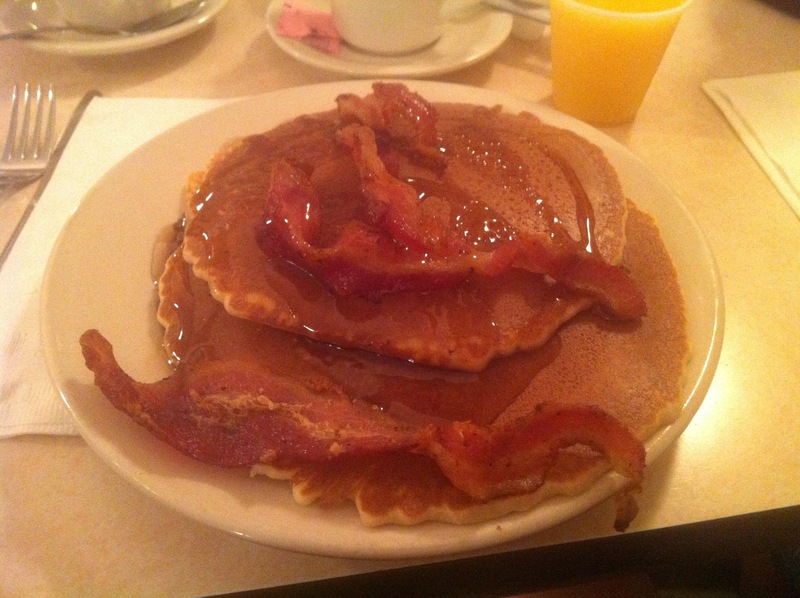 My favourite breakfast of all time is pancakes, bacon and maple syrup. I have this breakfast at home quite a lot as my husband is the best at making pancakes the proper way, just like in the States. So, my first morning in New York City we found a diner near to our hotel. I was amazed that diners are open at 6am when we ventured out, but they were and we weren’t the only people up at that time in the morning. I couldn’t resist ordering pancakes for breakfast. I was adamant that I would experiment with food while we were aware and come out of my comfort zone. But I just couldn’t resist pancakes and coffee. However, I was not prepared for the size of the pancakes that I was served. Huge, and I mean huge in that they completely filled the plate and there were three of them. Three giant pancakes, lashings of bacon done just the way I like it and smothered with maple syrup. As I am typing this I can vision it myself, and my mouth is watering. What a delicious start to my stay in New York! This entry was posted in Blog and tagged blogging, New York, New York City, NYC. the first time I saw the pancake portions in the US I also was shocked – the shear amount would have fed three people, but they are delicious – have a wonderful day! Thanks for visiting my blog Claudia, and thank you for the comment.